Next story in Aging 'Til death': Unless you have Alzheimer's? 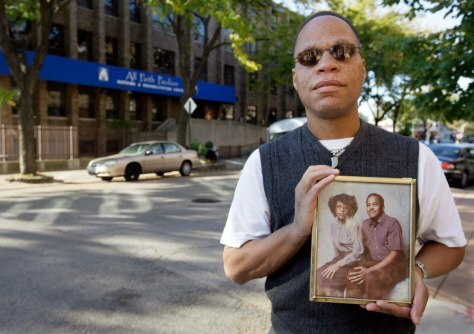 Russell Smith holds a photo of his stepfather, Ivory Jackson, and half-sister, Anita Jackson, outside the All Faith Pavilion nursing home on Oct. 9, 2008, in Chicago. The 77-year-old Jackson, who suffered from Alzheimer's, died in June after being attacked by his mentally ill roommate while he slept.